Sharn gra-Muzgob is an Orc healer and Spell Merchant and Associate in the Mages Guild. 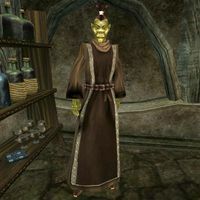 Sharn gra-Muzgob can be found in the lower level of the Guild of Mages in Balmora, and offers minor training in Alteration, Mysticism, and Restoration. She is wearing a common robe with matching shoes. Like all Orcs, she has a natural resistance to magicka, and can boost her health, fatigue and attack for short periods, at the cost of agility; Aside from that, she knows the following spells: Balyna's Antidote, Balyna's Soothing Balm, Cure Common Disease [Other], Dispel, Strong Resist Shock, Strong Resist Poison, Strong Resist Magicka, Strong Resist Frost, Strong Resist Fire, Spell Absorption, Calm Creature, Fifth Barrier, and Strong Feather. I'm NOT a Necromancer! : Discover a practitioner of the forbidden arts within the guild. "I CANNOT think with all these interruptions. PLEASE leave me alone." "What? Are you DEAF? No interruptions! I can't think!" "No. No interruptions! How many times.... Oh. You are one of Caius' associates? That is a different matter. Caius and I have a very satisfactory arrangement, and I'm sure we can come to some sort of agreement, if you will complete a little errand for me." "Again? Is this about the errand you are doing for me?" "Yes. You've been quite helpful. And if there's more you want to know, please ask." [Fireblade has been added to your inventory; 2 Scroll of Taldam's Scorcher has been added to your inventory; 2 Scroll of Vitality has been added to your inventory.] "The tomb is south of Pelagiad, just off the road, just before you reach the fork where the road goes southwest towards Seyda Neen and southeast to Vivec. You may need an enchanted blade. Some spirits are immune to normal weapons. Here. Take this old shortsword. And maybe these old scrolls will come in handy." "Yes. Andrano Ancestral Tomb. South of Pelagiad. Just off the road. Just before the fork where the road goes southwest towards Seyda Neen and southeast to Vivec." "The errand, then, is very simple. I need the skull of Llevule Andrano. You'll find it in Andrano Ancestral Tomb. But take care not to upset the natives. The Dunmer have some peculiar primitive prejudices against necromancy, and take grave objection to unauthorized tomb visits." "When you've completed the errand, then we can discuss the information Caius wants." [Skull of Llevule Andrano has been removed from your inventory.] "Very good. I'll just take that skull from you. Perfect for what I have in mind. Thank you. Now. As I promised. I'll answer your questions on tue Nerevarine cult. Go ahead." "Yes, yes. You've completed the errand and I'm quite satisfied." latest rumors: "Ajira made a bet with Galbedir about who would get to the rank of Journeyman first. I hope it doesn't end with more flame atronachs in the guild library like last time." Llevule Andrano: "He was no one special. A journeyman enchanter. There may be many skulls in Andrano Tomb, but you'll have no problem recognizing Llevule's skull from the ritual markings." Mages Guild: [Disposition ≥ 50] "A rat's nest. Unsound practices. Slipshod scholarship. Politics. Lamebrains and lunatics. But essential for research. And worthwhile for the discounts on services, if nothing else. Marayn Dren here, she's [sic] not so bad. Good intentions. And Edwinna Elbert, over in Ald'ruhn. Interesting projects. A bit out of touch, perhaps. But sound and sensible." "No. Of course not. I can't teach you spells. I'm NOT a necromancer. No. Absolutely not. Not a necromancer." "Where did you get that? That's MY copy of Legions of the Dead. Oh, all right. I'm a necromancer. Look. I'll teach you a spell, but you'll have to keep your mouth shut about this. I can teach you the Summon Ancestral Ghost spell, or, if you prefer, I can teach you Summon Skeletal Minion." "I can teach you more necromancy spells. For a price, of course. And as long as you keep quiet about this." necromancy: "In the Empire, necromancy is a legitimate discipline, though body and spirit are protected property, and may not be used without permission of the owner. But in Morrowind, the Dunmer loathe necromancers, and put them to death. That's absurd, of course, since the Dunmer summon their OWN dead to guard tombs and defend the family. Sacred necromancy is righteous, while philosophical necromancy is evil. It's primitive superstition, that's all." [Nerevarine cult notes has been added to your inventory.] "This Ashlander cult believes the long-dead hero Nerevar will be reborn to honor ancient prophesied Nerevarine will cast down the false gods of the Tribunal Temple, restore the traditional ancestor worship practiced by the Ashlanders, and drive all outlanders from Morrowind. Both temple and Empire outlaw the cult, but it persists among the Ashlanders, who care little for Imperial or Temple law. Here. Take this copy of my notes on the topic for Caius." "I gave you a copy of my notes for Caius. Read them." Not counting some mercenaries at Bal Fell, Sharn is the only Orc to appear in the Mages Guild in Morrowind. Though Sharn is listed as a trader in "Magic Items", she does not deal in any of the four types of items that can qualify as magic items, and thus this distinction has no real meaning. Sharn gra-Muzgob may slowly rise into the air for no reason. If she walks anywhere, she will immediately fall back to the ground, but when she is standing still, she will float into the air, eventually passing through the ceiling and completely out of sight, never to be seen again. If you see her starting to float, you should walk up and talk to her - this will reset her back to the ground. If she has already disappeared, you may be in trouble, particularly because she is required for a small part of the Main Quest. Use either the RA (Reset Actors) or PlaceAtPC "sharn gra-muzgob",1,20,1 console commands. Saving the game while standing near where Sharn is supposed to be, then quitting, and re-loading the save may fix this. This page was last modified on 23 November 2018, at 07:20.